With the extra load put on your system by running additional 12 volt equipment, a good quality leisure battery is a must. Fridges, additional lights, even radios all add to that power drain. Opting for a battery which has as many 'Amp hours' (AH) as possible within your budget is a sensible choice. Our suggestion is not to drop below 95AH which will give you longer life between charges. Don't forget to buy any clamps you may require (quick release are always useful). Popular brands include Lucas, Exel, Hi-power, Varta, Elecsol, Platinum, Halfords, Tayna, Numax and Trojan. Look for 'deep cycle' on the battery as this is designed to provide a consistent voltage as the battery discharges. Hi, nice website. 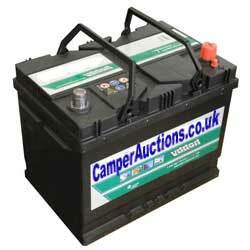 One question, can I use a deep cycle battery as the main one to start my camper? Yes you can use one, provided you get enough cranking amps for your vehicle. I’d generally opt for one with at least 25 percent more Amp Hours (AH) just to make sure if the cranking amps are not listed. Bear in mind that you will also need a deep cycle capable battery charger if you want to charge it independently as a cheap, normal battery charger can boil the acid away in a short period. What does AH really mean? I’m happy to go with your advice but just would like to know what I’m looking at! Amount of Amp hours (AH) divided by how many amps I’m pulling on the vehicle (A) is the number of hours (H) the battery will last. Example: 110AH battery divided by 10 Amps (Fridge, lights and radio on, occasional kettle, shower etc) = 11 hours. This is not an exact science as it depends on the battery condition, the temperature and of course how you vary the load on it. It gives you a good idea though so for a day of use you wouldn’t want to be using more than a few amps or you’ll kill most leisure batteries. You can of course give it a trickle charge from car or power point if you think you will be over-using it. That last comment is what I have been looking for. Simple formula but really hard to find. 110 AH battery just ordered through this site thanks.